Lionhead Studios and Microsoft Game Studios teamed up to release Fable for the Xbox in September of 2004. Since Lionhead's previous game, Black & White, was a game that I didn't like very much, and since I don't even own an Xbox, the release of Fable excited me not at all. But now Lionhead and Microsoft are planning to release Fable: The Lost Chapters, essentially a stand-alone expansion pack for Fable, and they're going to release it for the Xbox and the PC. In other words, this is sort of a complicated preview. Xbox owners already know about Fable, and they're probably only interested in the new content, to see if there's enough there to make it worthwhile to purchase the expansion pack. PC owners, on the other hand, might not know anything about the game, and so they're probably more curious about the mechanics and the storyline of the game, and whether it was ported in an effective way to the PC. 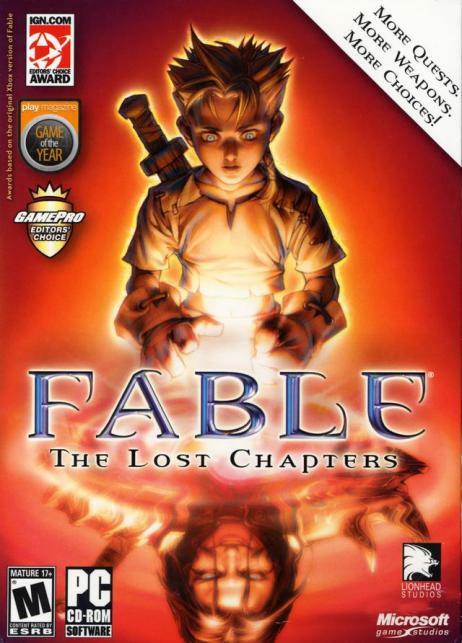 Just to add another layer to the issue, the preview version of Fable: The Lost Chapters that Microsoft sent us is essentially the entire game, with only a few optimization and compatibility issues to be resolved. So I could basically review the game here instead of previewing it, because I don't think the version I played is going to be significantly different than the final release. So what I'm going to try and do here is cover all the bases, mostly just describing what's included in the game and how things work, but also giving some analysis of the new content. That way hopefully Xbox and PC owners will both find something useful to read, and they'll both gain a better understanding if Fable: The Lost Chapters is something that they'll want to purchase when it's released in September. Fable is an action role-playing game. You start out as a child, only to witness bandits stealing into your hometown and massacring the inhabitants. The Guild of Heroes rescues you, because they see the potential in you, and it's only later that you learn why the bandits arrived, and that some of your family might have survived. Most of the game is then taken up by you going on quests for the guild, building up your character so you can rescue your family and take revenge on the culprit who ordered the attack. And, oh yeah, the main bad guy is also trying to take over the world and stuff, and so you have to stop that, too. That is, as with most action role-playing games, the story behind Fable isn't all that interesting or original. It's just there to give you a reason to kill a wide variety of enemies and go on a wide variety of quests. It's the mechanics of the game that make Fable fun to play, as it's enjoyable to build up your character, collect equipment, and defeat skeletons, trolls, bandits and more. For the PC version of Fable, the controls are about what you'd expect. The WASD keys drive your character, the mouse controls the camera, and the mouse buttons allow you to attack, block, and make special (flourish) attacks. You gain flourish attacks by successfully attacking and blocking enemies, and the flourishes are important because they can't be blocked. In fact, some enemies can only be defeated by using flourish attacks against them. The PC version also includes hotkeys, which make it easier to quaff potions, operate specialized equipment (such as lamps and shovels), and use (expressions) (such as giggling and dancing), and they help diffuse what is otherwise a fairly clunky menu-driven interface. Many parts of Fable work just like in other action role-playing games, such as how characters have three skill areas, one each for melee weapons, ranged weapons, and spells, and how characters gain experience in each by using the associated weapons. But Lionhead Studios is always good at throwing in extras to make a game more interesting and to give it more personality, and to make it different than anything you might have played before. For example, in Fable you get to watch your character grow up. This involves the character getting taller and broader, the character's hair turning to gray and then white, and the character acquiring scars from all of his battles. From what I can tell, this aging process is purely cosmetic, but it still makes the game more fun and involving.